from the nato's: nativity set giveaway! since e'rbody was raving about my nativity set from pen and paint, she decided to give one away because she's a treasure from heaven! i'm fuh-reaking out for you. this is my favorite christmas decoration... and i'm not just saying that. check out pen and paint's shop with ridiculously cute stationary and canvas paintings as well! to enter, commit to making one change this year at christmas which helps you focus on Jesus more...and leave your comment saying what it is. i am praying that others read through the comments and are inspired by your ideas and your changes however big or small. if you need ideas, you can read about how we're doing advent this year. 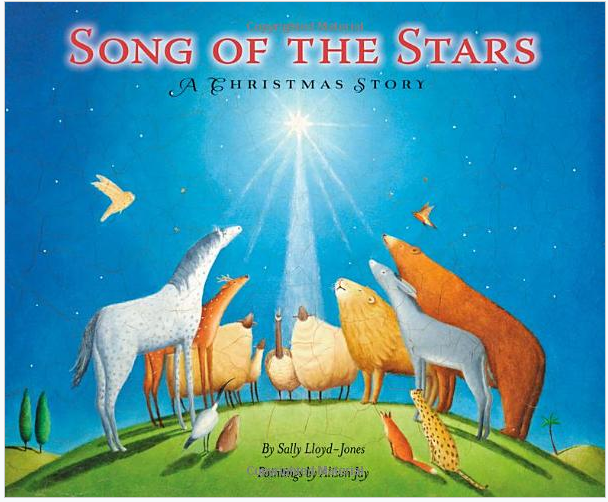 and if you're looking for a great book for either advent or just to read with your kids about the story of christmas during this season, i recommend Song of the Stars: A Christmas Story by sally-lloyd jones. art work and words are a home run! LOVE this giveaway, Jami. This Christmas, the hubs and I definitely want to be intentional about Advent. Spending time preparing our hearts for Christ, waiting in anticipation... mmm. Good for the soul. We are going to use an Advent book this year to help us focus a bit better! Thanks for the giveaway!! We aren't spending any money this year! Oh. My. Word. What an awesome giveaway. This year we are doing a new advent tree with my littles that are 24 little scripture book ornaments. I just want my children to never lose sight on the real meaning of Christmas. That Jesus is my gift. Jesus is their gift. xoxo. We are doing a "cash Christmas" again this year--last year we spent NO MORE than $75 for each of our 3 kids, and this year it's down to $50. We have paid off serious debt this year and haven't missed the extra junk we used to purchase at whim. What's so fun is the gifts we DO buy are SO SPECIAL and have such meaning. Each item is carefully chosen to meet its individual recipient. We pray before we shop, and we spend with joy knowing that we've saved up all year to do so. And we only buy for immediate family. Doing this has given us extra time to spend as a family, in devotion, and to just be THANKFUL for everything! Beautiful way to enter a giveaway! I will commit to more prayer. Prayer without distraction and with focus! Yay!! Awesome giveaway! My husband and I are going to follow along with the plan our church is doing - daily Scripture and hymns and prayer. I'm looking forward to it!! Thanks for always inspiring. My little family is remembering Jesus during this holiday season by focusing on charity. We will ring the bell for the Salvation Army, send gifts of thanks to our armed forces, and do one random act of kindness each day of Advent. Thanks for always inspiring. My little family is going to remember Jesus this holiday season by focusing on charity. We will ring the bell for the Salvation Army, send gifts of thanks to our armed forces, and do one random act of kindness for each day of Advent. I started a Chronological Bible reading plan for the next year! I am loving getting in to the word every (or almost every) day! I am doing it through YouVersion on my phone and it is so helpful...they will even send you reminders every day if you want! Ahhh, I love this! We're doing Advent for the first time as a family..reading through The Jesus Storybook Bible and doing activities that don't really correlate...because that's how I roll. Looking forward to preparing our hearts. We have come to worship him! We will be at church each Sunday of Advent. We are also starting a book advent today and about half of the books involve the story of Christ's birth. This is the most precious thing I have ever seen!! Absolutely adorable! This year we are focusing our Advent more on the coming of Christ than the activities of Christmas. We are using our Storybook Bible and I'm so excited! We are daily talking to our son about the meaning of Christmas and using our gifts, times, and treasures for OTHERS this season over ourselves. Oh yay!!! We are doing Truth in the Tinsel with the kiddos. It will be our first time doing an advent book with them! Love the nativity set! We are doing advent this year and making it focus on family unity stuff. Last year we just read a scripture and hung an ornament but this year we are going to throw in some surprises like getting ice-cream or making crafts. We've kind of been focusing on other people and missing out on the family stuff so it might seem backwards from what your saying but we've realized our priorities have been God, church, marriage, kids. It's an easy mistake for pastors to make I hear but still we have to fix it! These are the most precious things I have ever seen! Absolutely adorable! We committed to down-sizing Christmas this year. We always try to make it bigger and better than the year before, and that is just not what it is about. We want our boys to truly appreciate and understand the true gift of the season. We are doing advent, but probably only for 12 days since I have a two year old and he has a short attention span. I plan on allowing Elijah to make some ornaments and we're going to hang them on the tree one per day and I'll probably read to him out of his Jesus storybook Bible or the regular Bible a story that goes along with the ornament (I may have to stretch it a bit since my cookie cutters are trees, reindeer and snowman, but like I'll probably say the reindeer is a donkey and talk about either Mary and Joseph in the stable or Jesus' triumphant entry on Palm Sunday). We are just plain ole' talking about Jesus more and gifts less & reading verses as a family about His birth! we are telling the story of the birth of jesus in Luke every day to our little girl! We are reading the birth of jesus in Luke to our little girl every day! It might seem a strange thing, but this Christmas we have a no-surprises Christmas gift list. We have all written a list over the year of what we needed/wanted and we negotiated together for each person to get two or three small items (they know what they are). I'm hoping the focus will come off the gifts (which are things they wanted but know they are getting) and on to spending time together. It's been another difficult year in our household (and our community) marking the two year mark since the first earthquake. Living in a city that is still being demolished two years on is soul destroying and means our priorities have all changed. We will see how it goes. Right now it feels like we are all working together to make a special day for each other. I, also, am doing an advent devotional. But this post does have me thinking of more ways to focus on Jesus. :) Looking forward to reading other's comments. I love this nativity set! I'm following along with an advent devotional this year to keep my head & my heart focused on Jesus this season. I LOVE this set by Pen&Paint! What a blessing she is with her art. This year we have our first nativity placed in a central part of the home. I also created a nontraditional advent for my children using a small mailbox and letters each day, with a Bible verse and a prayer or rak to be done. I wanted my children to focus less on what they are receiving and more on our purpose as lovers of Jesus! This year I am committing to doing my best at deepening relationships and showing God's anchor of love through them. This probably sounds simple for many but, I'm not very good at keeping in touch with people. I get a little hermit-ish and caught up in my life. I have a strong conviction about this. We'll be reading out f the Jesus Storybook Bible with the kiddos for advent! And focus on making memories surrounding the miracle of Jesus as opposed to a focus on gifts. LOOOVE that nativity!! We were shopping for a gift for my niece and my girl started in with the, "I WANT THAT! MINE!" stuff that makes you feel like a really good parent. (It doesn't help that her birthday is the 16th so she gets a lot of gifts this time of year.) So I marched her into the living room where we have our nativity scene set up and said, "I'm going to tell you a story." And then I told her the story of Jesus' birth using the nativity scene as props. Since then, she has asked me to tell her the story about once a day. I'm hoping she'll get to the point where she can tell it to me with the nativity set. It's something small, but I love that she keeps asking for the story and I'm hoping that the gifts won't be the only thing her little 3-year-old head can focus on! I got all my shopping for the kids done before December started so that we could concentrate on our advent study, family memories and service. I am thinking I'm going to have to keep doing this for years to come - it's already improved my focus! That nativity is TOO cute! My son made an advent paper chain so we're reading that together each day! Wow I love this set!we are away for Christmas so this would be ideal to take with us to make our vacation house a little Christmassy! My oldest is now 4 so we are now really talking about the real meaning Of Christmas.We have 2 advent calanders that a great talking points that will hopefully bring my little one more of an understanding of the greatest gift of all and will encourage me to be more intentional about sharing The Lord with her! Merry Christmas to YOU! I'm such a fan of Pen and Paint! And she knows it :) Her work just shines and makes you feel happy. What a wonderful giveaway and criteria. Let's see, this year personally I am moving to give up worry and lift it all up the Lord, on little and big things. I continually am shown that not 1 ounce of worry has changed anything in my life. And it blinds me from the blessings right in front of me. Oh, I just love this and all the great comments/ideas. We are taking our kids to my husbands work this year to hand out toys to the kids that have to spend Christmas in the hospital. We are also filling a manger with hay every time they do a Christlike deed. My change: Now that my toddler is old enough to grasp more complicated stories, we're going to read from the storybook bible every night as a family. So many great suggestions! Sounds like I need to get this Jesus Storybook Bible that so many mentioned. We are only doing a few homemade gifts for each kid this year, and reading about the "real" Christmas story in several books we have. My daughters are young, so we will get into it more each year. I think the nativity set will really help them "get it"! They love to play with any sort of figurine. 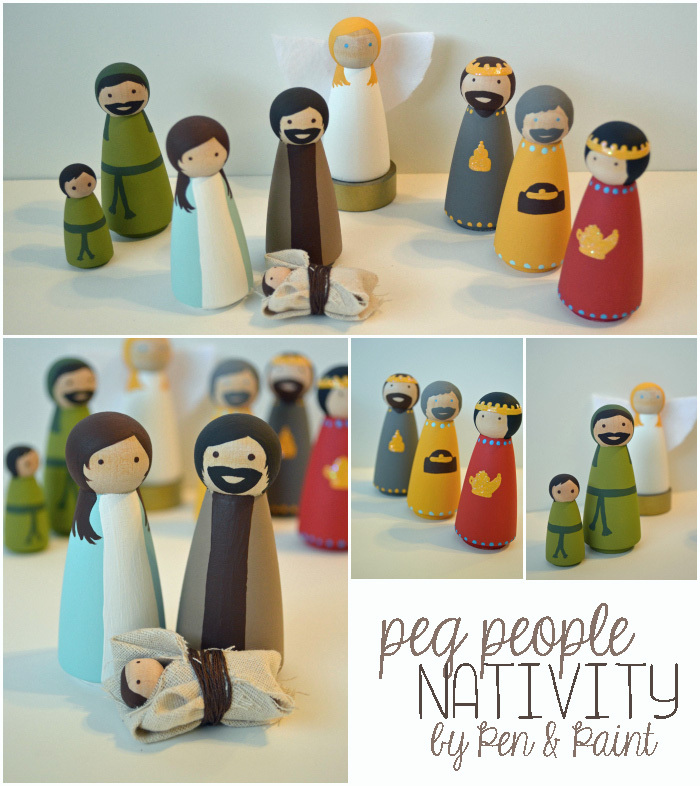 In fact, I wanted to make them a peg doll nativity set, but if I won one, that'd be even better! We're reading verses every night, and pumping up the excitement with our preschooler's for "Jesus' Birthday!" instead of "santa"
We are focusing more on spending time together and our relationships than getting caught up in the craziness of the season. Bring on family time! We are doing advent with our kids this year. We are shopping a lot less and giving more from our own hands and hearts. Thanks so much Lindsay and Jami! My 10 year old daughter and I are going to do an advent devotional this year together. I do a lot of Bible studying, but am excited to do this one together. We have done childrens Bible studies together, but am very excited for this!! We're still newlyweds and are looking to start traditions for Christmas that will be fun and Christ centered. We're heading out today to purchase supplies for a charity and are excited to start giving! I'm going to be doing 12 days of advent with my kids like you suggested with the paper rings! Daily focus on the reason for the season. I teach at a catholic school so I am celebrating advent with my students everyday. I am using your paper chain idea in my class! This year we want to focus on Jesus by using Ann Voskamps free Jesse tree printable and focusing on helping others instead of spending money on us! Each year we have a black and white party to raise money for a family to have a Christmas meal! I love this! With my son being almost 4 we are talking about the reason for Christmas (he even told a lady in the Dollar Store today that Christmas is Jesus' birthday) and why Jesus came. For now I tell him Jesus came to make everyone good people and help them good choices. To celebrate Jesus being born we will not only be discussing him more but we will have a cake and sing happy birthday to Him on Christmas. Thank you so much for this giveaway! This year, we tried finding a connection to the gospel as we put on our Christmas ornaments. "Oh look, a fish... Jesus told us we're to be fisher's of men." "A lemon- Jesus died to save people who love lemonade..." Ok, maybe that one was a stretch. This is my favorite new tradition that we'll totally continue each year! This year, starting tomorrow evening, we'll be lighting our Advent Wreath and reading our first chapter of "Jotham's Journey." We'll read the whole book, and experience this adventure in Bethlehem, right through the season until Christmas Day. I just know it'll be a special time for me and The Boy. Thank you for this lovely giveaway ... that set is just beautiful! We are doing advent for the first time together as a whole family this year. Honestly I'm tying to work more on my own heart towards the Christmas season, before the rest of the family think I've gone awol trying to force them to be more Holy or anything. Small steps on this side of the hemisphere. I'd like to incorporate some sort of family togetherness, focusing on Jesus, for the beginning part of the morning, perhaps lead our kids through communion together as a whole family for the first time. We are cutting way back this year. The hubs and I are only exchanging one gift each and probably only one for our baby daughter as well. We're cutting back on gifts big time - just one gift per child. And started a Jesse Tree - I'm looking forward to this time and think it'll be beneficial to all of us to have daily focus!! LOVE the nativity! This year we are sticking to a budget- and being intentional to give gifts that not only are great gifts but benefit other people, so some benefit a community in India (JOYN), some gifts will benefit charity, or the Tuberous Sclerosis Alliance (The disease my daughter has). I am also making gifts, and donating the money we saved to our friend's adoption! We have been so blessed & we truly have ENOUGH. So we want to give gifts that COUNT this year. my change this year will be this: constantly reminding myself that my mood and view of God is not affected by my circumstances. I've been doing She Reads Truth, and it's been a blessing to me already. whenever possible, I tack "despite my circumstances" on to the end of the scripture. example from today: "I will give thanks to the Lord with my whole heart, [despite my circumstances]." We gave away our Christmas trees, so that our only decorations are nativity scenes I've collected over the years. We've also tried to concentrate on others (as Jesus would) by donating books, clothes to those in need. whenever i get cranky and bah-humbug'ish... i will promise to pray about my attitude. i get bogged down by the details of the holiday and therefore don't enjoy it. we're doing a great advent devo with our family this year. This year, we are doing several service activities with our toddler, including a neighborhood prayer walk. I'm hoping it will help both of us love on our community during this season. what a great giveaway! thanks! we simplified gifts for our kids a bit - each are only getting 3 (b/c that's how many jesus got), and i'm asking the family to shop from the compassion catalog instead of buying me a gift. we're also going to continue with our jesse tree this year, and hopefully read along with the stories from the jesus storybook bible. My friends and I had a Jesse Tree Ornament exchange, so we are starting that today :) My little boy is going to LOVE it!! Such a fun give away! I'm doing Advent for the first time this year with my Jesus Storybook Bible----and yes, I'm 22 with no kiddos but this Bible is AWESOME!! I'm excited to spend time with Jesus focused specifically on preparing my heart for this glorious season. Thanks for the chance to win the beautiful nativity set, Jami! This Christmas I'll simply be reading through various passages of scripture and fully embracing the Christmas spirit. I've decided to participate in the Photo a Day for December on Instagram. I want to enjoy this time of year and the preparation to celebrate the birth of Jesus! i want to try to cut back on the gifts and talk more about the true reason for Christmas. especially after my 4 year-old exclaimed, "I LOVE CHRISTMAS, I GET TO OPEN PRESENTS!!!" I'll be reading 1000 Gifts (again) by Anne Voskamp. After reading her book last year, my heart was filled with gratitude to Jesus and for all of the other blessings in my life. I hope to re-read it yearly -- brings me back to such a simple, focused place. Thanks for the giveaway -- Joseph looks totally stoked to be a dad! We only spend $3 per gift for each of our extended family members. It means that we focus on being intentional and handcrafting our gifts with a particular recipient in mind, not just buying our way through the season. My kids put a lot of time and love into each gift, ensuring that each one is a treasure (at least to them), and that it's not about getting stuff. Love that nativity! We are doing a Jesse tree for the first time this year. I am very excited to make this a new family tradition. we are doing an advent study this year. we've never done one in the past...what kind of mother am i? what a cute nativity set!! i want to study and dive deeper into the Word and live it in my daily walk. Cont from above: so we will attach the legend of the candyca me to the cookies , which tells the gospel, and take it to our 2 next door neighbors and the 2 across the street. Love the nativity! I also love the challenge and all the great ideas in the comments! We started last year when our daughter was born and will continue this year... 3 presents will be all out kiddos will ever get. As far as we know that's what Jesus recieved ad gifts are NOT what it's about. We bought her a little people nativity and have been teaching her in ways her 17mo brain will understand what Christmas is about. I'm doing truth in the tinsel with my son. This year we're not sending out Christmas cards. With a new baby in the house, we just haven't had the time to get that "perfect" family photograph and it was just causing me too much stress. So we're taking the year off and using the time/money we'd be using with the cards to do other things as a family. Thanks for the chance to win! That nativity is adorable. We love to talk about Christmas and what it means. As we decorate the house with our homemade items, we try to use each moment to talk about what Christmas means to us and how we should take the good feelings and joy of this season and spread it throughout the year. Super awesome pen and paint. We are doing verses with our kiddos for the first time this advent! Yahoo! one change we're making this year is we are each giving to a charity of our choice this year. my 6 year old daughter and i watched the mercy project video you put on your blog a few months ago and that was it for me (and for her). we've been praying for those children every night. it really stirred something in both of our hearts. thank you. Oh man, that nativity is adorable!!!! We're breaking down the story of Jesus' birth into mini-sections for our 2 year old. The goal is to have family devotions after dinner each night telling/reading about a particular part of the story...tonight we read about the angel coming to Mary. So love the nativity! This year we are doing a different name of Jesus each day of the advent! Today we did "Wonderful Counselor" It just seemed like an easy, yet daily reminder of who we serve daily and at Christmas, we will see how it turns out! We're not in a rush to put our decorations and get busy. Trying to thoughtfully ease into the season. Beautiful! We are singing carols every night and chatting in bed about the real meaning of Christmas. Blessings to you and your family! My daughter would love this nativity; I think it would be a great teaching tool! We are lighting advent candles after dinner every night and reading scripture together :). So cute! I am planning on studying Mary and Joseph more in depth this year. I would also like to study the reactions of the people in the Christmas story. In a few weeks I will be singing with a group of teens at church during our candlelight service. This isn't something I would normally do, but the lyrics help keep my focus on Jesus as I do it. i haven't done advent since i was a wee child. i'm going to do an advent plan on youversion this year. have to start somewhere. We are starting a family tradition while our first born is still relatively young (17 months). We're following your suggestion and using the Ann Voskamp Advent Guide and reading the stories from the Jesus Storybook Bible. We just purchased that Bible tonight and am so excited to share this special time as a family each night before we put Jmes to bed. Adorable Nativity, by the way. We have a scripture advent calendar we are doing this year. One passage a night to remind us not only of the miracle of his birth, but the majesty and purpose of his life. We are doing a combo verse a day, Jesus Storybook Bible story, and activity a day. Realistically, we'll be lucky to do the verse each day, but we'll give the rest our best shot and there will be lots of grace when it's not how I picture it in my mind. I'm especially excited to have our 6 year old find the verses in her new Bible. She's a highlighting queen, so these will be great verses to highlight along with all of the verses she already knows from Seeds Family Worship. I feel great comraderie with you because I'm a Sally Lloyd Jones junkie, too :) I can hardly make it through her Christmas book with out crying and can't wait to give our girls Thoughts to Make Your Heart Sing for Christmas! This Nativity set is absolutely darling. What a lovely giveaway. We're toning down Santa. He's still there, but very much as a story, not a reality or a reason to be good. What a great giveaway! In this season where we focus on God giving His Son and the birth of Jesus, I have enjoyed being intentional in my devotions and going beyond the birth of Christ. I have been focusing on what Jesus did for me. I've been reading the book of Ruth and looking at parallels between Boaz, her kinsman redeemer and Jesus as my kinsman redeemer. With three under the age of 4 we are just trying to speak about Jesus rather than put all of the focus on Santa and their behavior. We want them to connect this time with the decorations and excitement with HIM. We are also doing what Emily does... A want, a need, and a surprise for each child. I bought my first in depth study Bible, and I'm excited to dig even deeper into Christ's birth and the Cheistmas story! my family has actually already celebrated our Christmas together due to military life and my husband leaving for a deployment, etc, so I am excited to ENJOY this season instead of being caught up in all the to-do's! my personal goal is to read Morning and Evening each morning, as a way to begin the day with my focus on Jesus, since I usually don't get to spend time in the word until later in the day during my kiddos' naptimes. as a family, I have organized some fun crafts that focus on different aspects of the Christmas story and we will continue to read our Storybook Bible. I love this time of year! My awesome husband and I are going through an advent study together :) I'm so excited... And ps. That is the sexiest nativity set I've ever seen!! we have a little one year old girl..and we decided not to do the whole santa thing, we want maggie to get excited about baby jesus instead, so we'll have jesus' birthday party. we are doing advent for the first time this year! i am following your suggestion and making a paper chain for 12 days of advent. my husband has been deployed since june but he gets home in early december so it's just enough time to do 12 days of advent! We're doing a stocking for Jesus this year. We will add letters to Him of things we are thankful for, acts of service given, small sacrifices and prayers given for others. Then we can read everything that we did on Christmas. Hopefully this will help us keep christmas more Christ centered. i am the first kid in my family to go away to school. i moved from alaska to indiana so i spent thanksgiving without my family, believe me there are quite a few of us. thankfully, for Christmas i will get to go home. to focus more on Christ this season, i am going to focus on fellowship with my family. We are reading the Jesus Storybook Bible and doing an activity each day. The activities are small and simple. Some include giving to others. This is the first year for us to do advent activities and a study as a family. I am excited! We are being super intentional about gifts - and headed up our church's Operation Christmas Child. Even with the boxes gone, we are continuing the focus about praying for the kids that are receiving them to know that Jesus loves them personally. Love this nativity!! This year I plan to start living intentionally, sharing Gods word and love not only through actions but through words as well. It's our first year doing advent! We have a one and a half-year old, and I look forward to growing in excitement with him about the celebration of Jesus coming to earth. SO FUN to see Christmas through a little one's eyes!! We are focusing more on gifts this year that cannot be bought: time, helping friends & family in need & loving each other more deeply as we focus on the greatest gift of all, Jesus. I am committing to doing advent with my little ones this year. I was feeling a bit overwhelmed, but you inspired me to do it anyway...we're going to keep it simple and try for 12 days! :) So excited about this giveaway!! In November, with December looming upon us and stores filled with Christmas decor since July, I had the discussion with my children about the meaning of Christmas and how it is meant to be a time of year when we celebrate the birth of Jesus. We talked about all the presents we get under the tree for ourselves, but what is our gift to Christ - it's His birthday after all. During Christ’s ministry so much of His message was one of charity and kindness to those in need. Our family decided to find a way, each day this month, to give to others through service. It can be as simple as offering to return a shopping cart for someone at the store all the way to buying much needed necessities for those who are without. I am hoping that as we set out to achieve our goal not only will we give Him gifts that He will love, but that it will change our hearts forever (which He will love too) and we will find ourselves thinking more of others and doing more for others as He would have us do. My husband and I have been married for three years but we don't have kids yet. We want to try to 'decommercialize' Christmas in our home so that when we have kids, Jesus is at the centre of the holiday from the very beginning. We're giving fewer gifts to each other, spending the energy that we'd otherwise spend on Christmas baking etc. etc. etc. on reading the Bible together, and buying gifts for our Compassion and World Vision kids. This will be a VERY good Christmas! Lovely giveaway..and lovely blog - filled with inspiration. Honestly, this year we have found faith and are determined to instill it as best as we can in our children (2 and almost 5). For my family that means getting to church, searching for a community teaching about giving of ourselves. I come here looking for inspiration and I always find it. Thank you. We are doing Advent with our kiddos for the first year ever. Buying less [resents, and trying to be more intentional in our giving. We are going to try and make it to church every Sunday during Advent - small steps . . . I also want to use your advent idea to do each night - we'll see ;o) Not sure I'll be able to get it together enough to do it every night - but I'm going to try!!! Oh, my! What a cute nativity. This is our first year with a kid (granted she's only 10 months), but I plan to be talking about the Christmas story with her (or rather...to her). It's never to early to start teaching, right? We are starting to teach our 20-month old more about giving gifts than picking out what he would like to receive. With my children now 4 and 2, we are doing advent for the first time. Tying in the meaning of Christmas and who Jesus is, and why this is important. And we are looking for a faith home (ie, church). We are also trying to spend the month doing random acts of kindness in the spirit of what this holiday is really about. We started Advent yesterday! Thank you so much for all the inspiring ideas and resources. For real. I LOVE LOVE LOVE the nativity set! We are doing an advent reading through the Jesus Storybook Bible! With two babies ages 1 & 2 and another due early January, my husbie & I decided to postpone advent for next year & include Christ more in our decorations...this year I am creating garland for our tree with a condensed version of Isaiah 9:6. I have been wanting an interactive Nativity set for the lil ones so this would be perfect! We are reading bible verses daily with our 2 and 4 year old. We also have a sticker advent nativity calendar for them to do each day. Also limiting gifts, because although Santa and presents are a fun part of the season, they are not the reason for it. Trying hard to steer their little hearts to a Jesus focus now and always. I am also having a baby sometime around Christmas Eve...talk about a new perspective for Christmas. Truly. to pause. to reflect. too often this season is frenzied, disorganized, and materials-focused. by taking time each day to take a look outside and enjoy the scenery; to stop and (literally) smell the coffee, the pine trees, the perfect smell of my baby boy; to listen, REALLY listen to some of the lyrics of some of my favorite christmas songs, and by closing my eyes and thanking Him for these moments and for creating them. Focusing on the Christmas Story rather than who gets what for gifts. We are trying to remember to use this website - http://www.d365.org/followingthestar/ - as a family. How lovely! (I happen to collect Nativity sets ... That sounds odd, but I do enjoy them and my students benefit from their presence also.) This generous giveaway has admittedly made me swoooon! This year I am going to continue reading Sacred Scripture daily, and also spending meditative time at the chapel near my house at least twice a week. I have done it before but the busyness of recent months has distracted me - so great incentive to get back. Wishing everyone a blessed Advent, leading to a joyful Christmas! This year I want to really help my daughter understand the story of Jesus' birth and the importance of Him. She is finally getting old enough to really unrstand. Reading Nancy Guthrie's compiled Come, Lord Jesus. And although we've done the Ann Voskamp advent devotionals before, we've never done the Jesse Tree ornament thing. I still don't have a Jesse Tree up, but this year I made salt dough ornaments & painted a little scene on each to go along with the advent reading for each day. The children take turns putting one on the tree each night after devotions. We are doing an advent calendar for the first time this year too! We're adding something new this year: the Advent Book. I've been hearing a lot about it so I'm excited to use it. We opened the first door and read the first part of the Christmas story last night! we're doing a jesse tree for the first time. so far, i'm loving it. We have decided to do just three gifts this year one representing like the three gifts brought to our Savior. We are doing a spiritual gift, and need, and then a desire. The goal is for us to focus on His birth and the gift we have already been given for us. I love the desire I see in my girls to share this with others already. This year, I we are planning to be home during the holidays instead of traveling to see friends and family. I think being home and settled will help us slow down and take more time to remember that we are celebrating Jesus... not just rushing from one event to the next. I think your question is wonderful and I will continue to ponder this over the holidays. The Nativity Set is so sweet! I am doing a solo advent Bible study. This year, we'll be reading an advent book together as we prepare our hearts for Christmas---and also for His return. My brother is incredibly ill and most likely won't live much longer so in all honesty I am just trying to make it through each day. My kids are 5,3, and 1 and old enough to have some understanding of the true meaning of Christmas. We don't "do" Santa, just explain to them he is pretend just like Cinderella is, and celebrate Christmas as a birthday party each year. I am hoping to add in a 12 day Advent plan this year but it might not happen since my brother is so ill. I do love the nativity set, we don't have a model figure one so this would be great. This is our family's first year doing a Jesse tree. I'm looking forward to slowing down, and having a purposeful Christmas season. One focused more on Christ and his coming than on silly details and stress. Awesome giveaway! I think that nativity set is the bomb.com. We are doing the Jesse tree this year and giving the children (and each) other less gifts and giving more to others - we're excited about focusing more on Him this season AND the rest of the year! This year we are doing a real advent focusing on the coming of Christ for the first time! Also my adult siblings and I are not exchanging gifts this year and are going to give a gift to a less fortunate family instead by pooling our money... This is a huge step for my siblings as they are not followers of Jesus and I have been praying that they would want to step out of their comfort zones to give to others this year! I am feeling very blessed to be able to be giving this holiday season! This year we are staying at home on Christmas Eve and Christmas Day. We are planning to read through the Christmas story in Luke 2 on Christmas morning, and probably read the corresponding story in the Jesus Storybook Bible to make sure that our oldest (2 yrs) understands as best he can. He loves that Bible! My husband and I are doing Ann Voscamp's Advent Devotional each day. We also started the tradition last year on Christmas morning with our newborn to read the story of Jesus' birth in the Jesus Storybook Bible which we will be continuing this year. We are doing a real advent for the first time. We are also going to have our 1st grader read the Christmas story in Luke since he can now read very well! we are doing a shortened version of advent this year....similar to your twelve days. we are also making christmas more about jesus and his gift to us by only doing four presents (want, need, wear, read. love this nativity! I like your idea of a shortened Advent...twelve days instead of twenty-four. We have been reading the Jesus Storybook Bible and read through Ann Voskamp's devotional last year. I love this nativity set! For the first time, I'm doing an Advent devotional with my son. We are going through "Truth in the Tinsel." Two days in and I am seeing my son so excited about learning more each day. We are going through a series with our girls called "Everyday Emmanuel" and it gives activities and Scriptures for each day (or whenever you want something to do) during the month. We are doing The Jesse Tree for advent with my toddler. He may not understand it all eat, but we're starting the tradition now anyways. So funny! We're starting Jess Tree this year with my 23-month-old and I've had the same thought. We're reading as many of the stories as we can from her preschool bible, but even that is a bit advanced for her to sit and pay attention to. Starting the tradition is important though and I bet they'll get more then we expect out of it! Ahh so cute! We are doing Advent Actions that involve doing things as a family and doing more to serve others. Love this little set! We're using a Jesse Tree this year to be more intentional about celebrate the story of Jesus that we are a part of! What a great giveaway! This year, we're doing a real advent calendar for the first time. Every day we'll focus on a particular scripture related to the anticipation and birth of Jesus to prepare our hearts! We got the Jesus Storybook Bible that you recommended and are reading one story a night to our kids. we are also doing the Truth in the Tinsel ornament plan with our kids. Thanks for the opportunity! This year I am committed to family 100%. I am making a promise to myself that I won't spend a dime on any clothes for myself in 2013. I have plenty of nice things already and have decided that I want to try this for a year. I am excited about this, and am looking forward to see what kinds of surprises it may bring. Totally downloaded the Advent readings you did last year. Would love to make the ornaments next year, but just going to stick with the ones that are provided for now. We are doing Advent with the Jesus Story Book Bible...hoping to incorporate the ornaments next year. My 7-year-old is doing the readings! Thanks for the fun giveaway and inspiration! We are celebrating advent with our church family and being much more intentional about placing Christ at the center this year. My husband and I decided to forego buying gifts for each other and instead use the money to help a family in need. The Lord has blessed us with so much. It is our hope to bless others both spiritually and tangibly! In the past, we've adopted an angel from an angel tree. But this year, we prayed about a family around us that might be in need. We are stocking a box full of food and fun things for this family and will secretly give it to them. It helps take the focus off of us, and onto what Christ did for us. In return, we want to give, because of all the things that have been given to us! I'm going to do the #shereadstruth Advent study to help focus my heart daily during this season! I'm actually reading through an advent book for myself to get more in the "CHRISTmas Season" and our church just gave us a wonderful book to do with the kids. So I would be SO excited about winning this nativity set. I have a set but it's very breakable and I don't allow the kids to play with it. So I would love something for them to get really hands on with! Love this giveaway...this year I am going to commit more to focusing on what Christmas is REALLY about by having my children read the story of Jesus' birth at least once every few days. It seems that people have become so commercially involved with the holiday that they forget what it's really about. I don't want my children to forget that. I am doing a Jesse tree for the first time this year, using Ann Voskamp's download. We are doing advent with our kids, hopefully a little something each night and I am seriously coontemplating buying less gifts and how to make them more meaningful! this is the 2nd year to celebrate Christmas with my son and reading your posts last year and this year have been such an inspiration to teach him at an early age what the REAL reason for Christmas is. it is so easy to say, but so hard to actually accomplish. this year we are focusing on learning the characters in the nativity scene and reading the Christmas story from the Jesus Storybook Bible. thanks for your posts...keep up the great (and honest) blogging! My husband and I have never been big about gifts or extravagance, but we've also never been "passionate" about making Jesus the focus either ~ reading His birth story out of tradition instead of need or desire. Our children are small (3 and 2) and we realized that they won't be passionate about Christ if we aren't. This year is the start toward our Christ-centered Christmas (and daily living). One gift a child to relate how Jesus is a gift for us and giving to another family through Angel Tree to demonstrate our love for others through Him. *Side note: I L.O.V.E. your blog. I'm thankful that you are willing to "put it all out there." I am almost always encouraged and/or convicted. Thank you for letting all of us readers be part of your journey! I'm working on making my life more Christ-centered. Better prayers, more scriptures, more quality time with my family. I love this season and the chance we have to refocus and try again! Advent is our favorite part of Christmas! We make paper chain links with activities on them that we do every evening before bed. Most have scripture highlighting Jesus' mission of drawing people to Himself. And I love the peg people nativity! Gorgeous! Right now, we are focusing on orphans/widows with our children. They are struck by why they are so important to God, so we have decided to pray with our children to see in what way God is asking our family to act in order for us to take care of them and put it into action. My husband and I have always celebrated Advent but this is our first time as a married couple. We will be merging our traditions to make new traditions as a family. We have an Advent wreath that we light every night with a special prayer and will be attending Vespers on Fridays. advent is a big deal around here - actually my husband and I just got back from a silent retreat to ready our hearts a little. coming back to three cah-razy kids took the quiet away, but it got me excited to really focus with them on eagerly anticipating Jesus' arrival. we have an advent calendar I made last year filled with everyday activities - some are silly and fun (hot chocolate and singing), some are more focused - pray for your teachers, read the story of Jesus' birth, etc. To take my granddaughters to a live nativity scene.